So, every now and then you get a tech product that you feel like you’ve known forever. Here’s something we’ve learned after a few weeks with the Lenovo Smart Display. 1 – Google Assistant. Yeah, it’s great, but putting a screen on it makes it so much better. 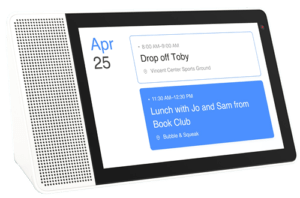 The Lenovo Smart Display may not be the only thing like this with a screen, but it’s easily hands down the best we’ve used so far. Here are the basics. We’re looking at what essentially is a Google Home with a display. You have the choice of an 8″ display for $200 or a 10″ display for $250. 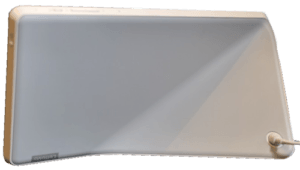 If you are going to be using it in a small space then the 8″ model will certainly suffice. However, if you have some room to spare, the 10″ model is the way to go. 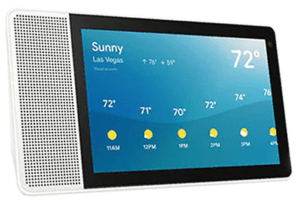 The Lenovo Smart Display is one of the first with Android things. Think Android, only without all of the phone stuff and without a launcher. That means it’ll get updated and it’ll get security improvements, it’ll get better. It’ll get smarter. It’s always on, and it’s always connected. 2 – Getting your news before it gets you. The news itself is not necessarily any better, but now, instead of just relying on an audio-only briefing, you can get your news in video form. You’ve got a bunch of options for video like CNN, Reuter, The Today Show, CNBC, Cheddar, Bloomberg, and if you’re in a big city you have a ton of local offerings, and more are always going to be added. OK, so maybe it’s not on the minute news because this video stuff takes time, and there’s nothing wrong with getting your news via voice, but getting visuals along with it is great to have as an option. There’s no question that you can do things on video news that you just can’t on the radio. 3 – It’s gettin’ hot in here. Another thing that is great about this is recipes. I’m not only talking about video recipes but just being able to visually see an ingredient list as you’re going along is a million times better than having to ask for those ingredients over and over again. For people like me that occasionally have a drink or three while cooking, it’s really handy! The point is that instructional cooking is just one of those things that work. It’s the reason why we have cookbooks, it’s the reason that we have cooking shows, and the reason why following a recipe on the Lenovo Smart Display is just better. If you are looking for more than the pre-loaded recipes that the Smart Display has, there is a world of YouTube cooking videos waiting, just for you. There’s Chromecast for everything else. 4 – The hills are alive with the sound of music. Even music looks better. Yeah, you read that correctly, even music can look good. When listening to your music you have all of the music information right on the front of you like the song title, album name, and band, it’s great. This does vary a little bit depending on the service that you use. For example, YouTube music gives you all of the information for the song to now as well as a look at the next. All the services make it easy to see what it is you might want to listen to. There’s just something about that suggestion, that makes your music experience better. A lot of people use Spotify and there’s no question that video makes the music better, just like YouTube. YouTube is video, and YouTube is video on the Lenovo Smart Display. If you’ve been holding off on trying YouTube TV, this is the perfect opportunity because it connects really well with Lenovo’s Smart Display, and turns it into a really great kitchen TV display. 5 – E.T. phone home. 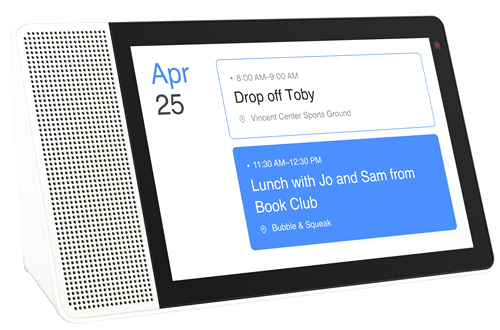 Google Duo is built right into the Lenovo Smart Display, just like it’s built into most Android phones these days. Or, you can download it for the iPhone as well. All you have to do is tell it to call someone in your contacts and it’s does just that… calls someone in your contacts! A great feature for us that want privacy is if you’re not actively using the web camera, you can physically slide a little shutter door over the lens and it can’t see anything. This is a simple feature that any device with a camera needs to have. This is a great buy. If you can get the 10″ model on sale, it’s an even better buy. Video just adds a little something extra better to something that already has an excellent audio experience with Google Assistant. This is so much better than just a voice-only speaker. You can find them at Walmart, Best Buy, and stores that sell laptop goods, and of course, online.